December saw the entry of two fancy Chinese restaurants in San Francisco, within a few blocks of each other. The first, Hakkasan, founded by a self-made billionaire from Hong Kong has made waves wherever it went for its extravagant interiors and exquisite food. 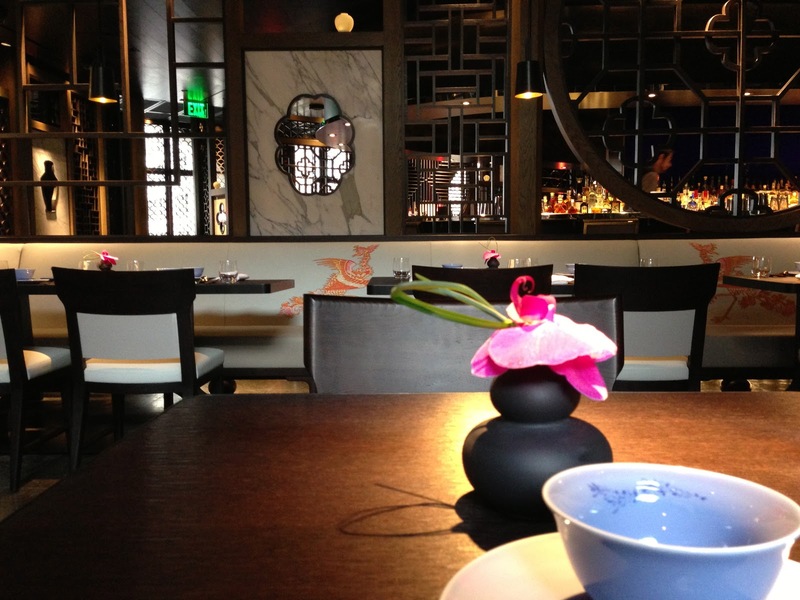 The second, M.Y.China, is celebrity chef Martin Yan's first own restaurant. Yes, that is the same Yan from Yan Can Cook! M.Y.China opened directly under the Dome of the Westfield Mall on Market St. Not surprisingly, it was crowded on the weekend. I was able to get a seat at the bar which serves their full menu. M.Y.China expects to charm its patrons with a multi-sensory experience with the help of large open kitchens with fired-up woks, noodle chefs who demonstrate hand-pulled noodles and Chinese twist on cocktails. I started with the Fire in the Wok cocktail: Azul Tequila, lime juice, Fresno pepper, agave and soda. The M.V. dim-sum collection was a pretty good one. The shui mai, the hargao, steamed bbq pork bao, sticky rice, seafood dumpling and Mongolian bao were all perfect. 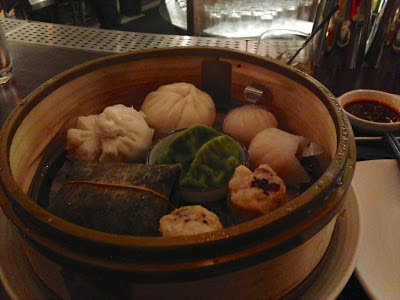 Of course, one can argue that you can get similar delicious dim sum for a fraction of the prices elsewhere in this city. But none can combine the food with the flair on display, and none of them within an upscale mall that can get your Christmas shopping done too! Incidentally, that large 800 kg (1700 lb) bronze bell hanging over the ball? Found in a monastery in China and shipped all the way here. There are some other interesting artifacts here too: old Chinese snuff boxes, moon cake moods and bronze monks - all with considerable antique value I am told. A few blocks away is the new Hakkasan. 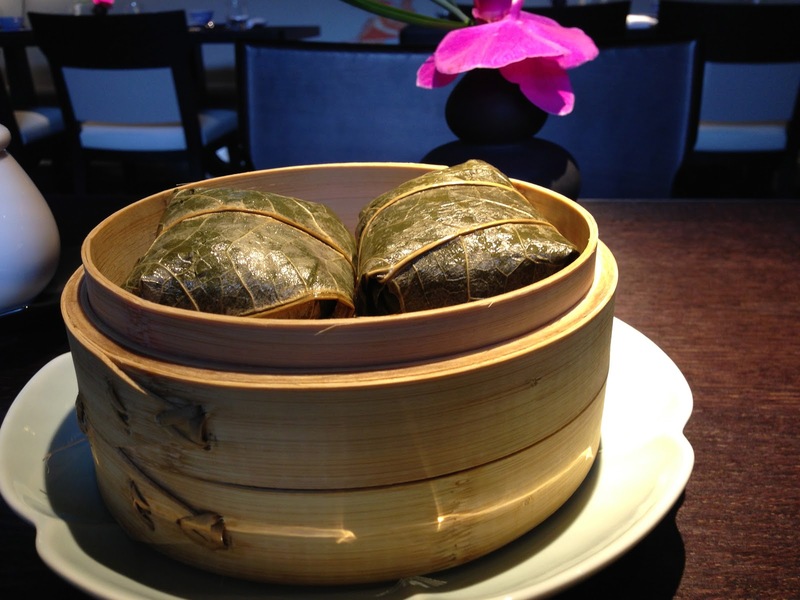 Founded by Alan Yau, who emigrated to the UK as a kid and went on to found a chain of successful restaurants. 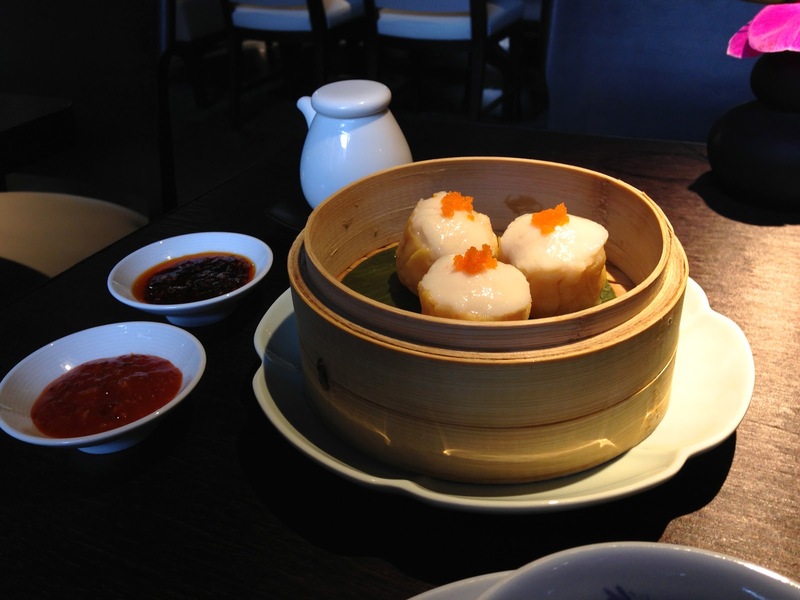 Hakkasan first opened in London in what must have been the classiest Chinese food in the British capital. It went on to win a Michelin star and opened other branches around the world. 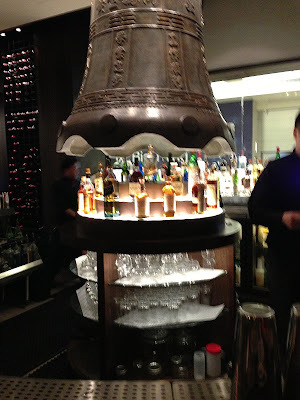 Incidentally, Hakkasan opened in Mumbai before it did in SF! Alan Yau sold majority share in Hakkasn to a Middle-Eastern billionaire. Last I heard, the new owner was opening the biggest, baddest Hakkasan of them all. Where else, but in Vegas! This one will be a restaurant and lounge spread over five floors of the MGM Grand. They have been signing up almost all the headline DJs in the country for big bucks. Anyway, coming back to Hakkasan in San Francisco. I ordered some Scallop shuimai, Sticky Rice in Lotus Leaf and an entree of Spicy Prawns with Jasmine Rice. The dishes were exquisitely presented and tasted heavenly too. The shuimai was topped roe while the Lotus Rice was a lovely preparation with chicken, scallops and other seafood. 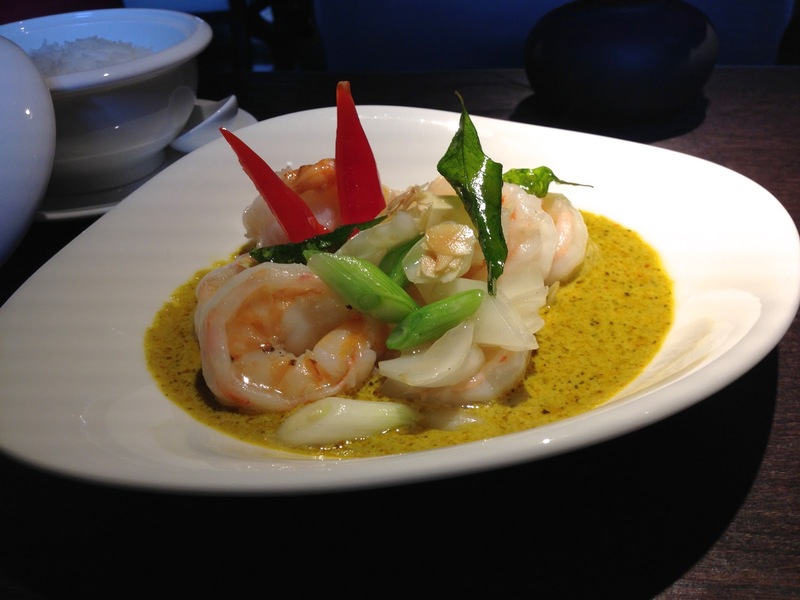 The Spicy Prawns was prepared in a mustard sauce that reminded me on Bengali Indian dishes. I finished off with an excellent Tapioca Pearl Pudding garnished with a carmalized spiced pineapple. 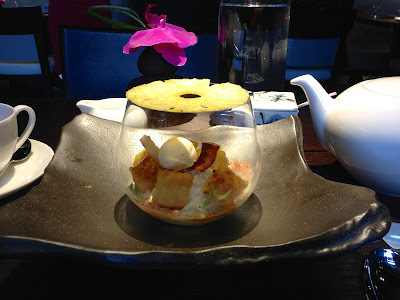 Hakkasan is the place to go, if you want to dress up and be seen in the trendiest Chinese restaurant in town. Among dim-sum places that have existed for a while, I continue to heart Yank Sing. I was back here eating yet some more dimsums and they were as lovely as ever. However, this is the kind of place where you drop in for a quick lunch with colleagues or for a casual dimsum lunch on weekends. Nice dining....after reading this piece, I know dining is more than just eating - it's experiencing. @Renuka: Thanks for visiting and leaving your comments here. Hello! your blog is great, I'd love you to join my travel websites, and you put my link on your site, and so we benefit both. @Munekita: Thank you for visiting! However, I do not do link exchanges. Sorry.